Unit 77 is a cyborg…but he used to be so much more. Tortured by glimpses of his past, the former Captain Andrew Fischer goes through his days in a metallic nightmare, feeling broken inside though he doesn’t know why. Doctor Claudia Chambers is distraught. 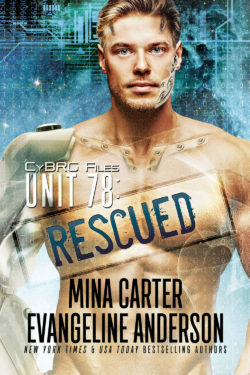 After a land mine blew up Drew Fischer and his unit of elite Space Corps Marines, she was forced to implant the CyBRG device in all of them which turned the men into machines. But she keeps catching glimpses of humanity from the supposedly inhuman Captain…could it be that part of Drew is still in there, longing to get out? Claudia is almost afraid to hope — she loved Drew once and thought he might return the feelings. But how can a woman love a machine? Half man…half metal…all heart. 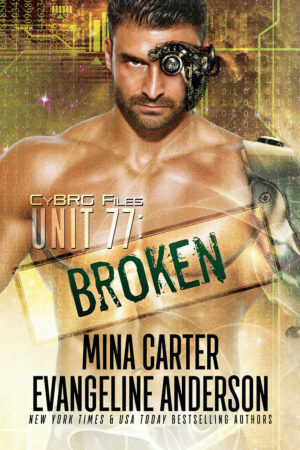 The CyBRG series by Evangeline Anderson and Mina Carter.